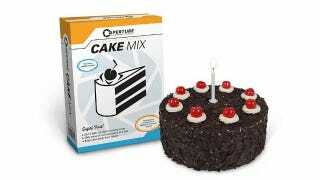 Your next baking session can crack jokes like it was 2007 now that official Aperture Science cake mix has been made available. It comes with the candle, 275g of cake mix, 50g of cream powder, chocolate flakes and 80g of liquid thickener. All you need to complete the thing are some cherries and a post-apocalyptic underground science laboratory. It's available on Amazon. Don't pay any attention to the user reviews. All those one-stars are from, yes, "the cake is a lie" idiots. Sigh.